I was determined to join every race possible and I have been doing that to stay fit and to relax. 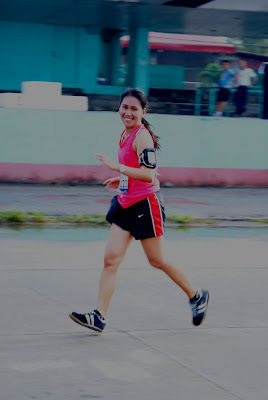 But, when I decided to take the 10km road run for a change, I knew I was going to hurdle a tough run. No wonder, only two (2) runners joined the race. With 8 runners to traverse the long route with only one (1) water station, I was up for big risk. However, I conquered the race in 1.15 hours and finishing 1st place in the women's category and 4th place in men's category. So, I could only be happier and prouder. I shall be practicing more and I can only conquer more fun runs.